A pristine tile floor that is marred by a streak of brightly colored nail polish from a dropped bottle or cotton ball stained with nail polish remover and color can ruin your day as well as the tile. No matter if it's spilled acetone from removing nail polish or the viscous nail bed color itself that has stained the tile, the blemish can usually be removed or at least minimized with a few tips and tricks. Depending on the type of tile, the amount of liquid and the presence of acetone, you should be able to eradicate the stain on a tile floor with tile polish remover and other household items. While nail polish remover is actually a good, inexpensive and effective cleaner for many types of tile, it can do damage if left too long on the surface of the tile. The ethyl acetate and acetone in the nail polish remover can cause uneven discolorations in solid-colored tile or interrupt an otherwise pleasing pattern of natural discoloration on sealed stone tiles. To remove acetone, make a four to one mixture of water to vinegar with a few drops of dish-washing liquid. Scrub at the acetone spill, dry it and repeat to make sure all of the nail polish remover has been cleaned from the surface of the tile. Check for any splashes that may be outside of the original area of the acetone spill. If the tile is ceramic, acetone won't be a problem to quickly clean up nail polish that has found its way onto the durable surface. However, not all tiles are built the same. Stone tiles that have not been sealed, some porcelain tiles and porous soap stone, granite and marble will be adversely affected by drops of nail polish remover or streaks of nail polish that make their way to the surface. If a spill occurs, speed is the best first defense. Wipe up any spills quickly by blotting, not wiping, in order to reduce the area that is affected. If acetone has discolored the stone, shoe polish or a professional stain remover can mask the mark. If polish has hardened on the surface, use a butter knife to carefully chip the polish off the stone without causing damage. If a blemish of color is left behind, dab the area with a cotton ball with just a touch of acetone on it so that it doesn't spread the nail polish remover beyond the stain. If a puddle of polish has somehow found its way to the tile surface, you can clean up nail polish with sugar if it is still wet. Apply a teaspoon of sugar at a time to the pool of polish until it begins to clump. Start at the edges and work your way toward the middle. This can stop the stain from spreading as you add the weight of the sugar to the colorful blob on the tile. When the polish has absorbed all of the sugar it can, it will look like a large, glittering glob and should be able to be picked up without spreading the underlying wet product to other areas of the tile. 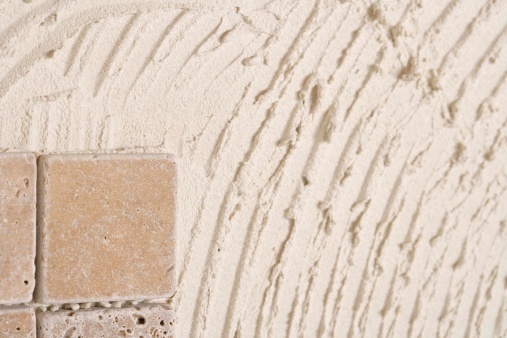 Sugar also works as a gentle abrasive that will help to lift the liquid from the surface of the tile. Once the excess polish has been removed, tackle the remaining stain according to what works best for the tile that was affected by the spill.